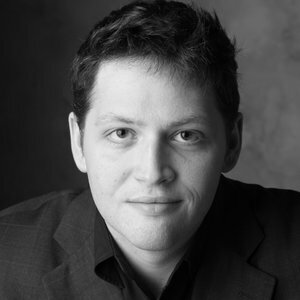 Tenor William Bouvel has performed regularly across the United States and Europe with groups like Hampstead Garden Opera of London, Opera Lafayette of Washington DC, Haymarket Opera Chicago, Madison Early Music Festival, Baroque Band, and Benslow Baroque Opera. He graduated from the University of Chicago with his Bachelor’s degree in Geography, attended the design school Archeworks creating innovative approaches to disability education, worked as a computer systems designer and programmer, and was a manager in a publishing company. During all this he cultivated an active career as a soloist. In 2012 he was a young artist with Opera Lafayette in Washington DC and debuted with them at the Kennedy Center in Washington D.C. as Giovinetto in Paisiello’s ‘Il Barbiere di Siviglia’. In 2014 he received his Masters of Music degree from the Royal Academy of Music in London where he studied with tenor Philip Doghan and coaches Iain Ledingham and Audrey Hyland. In 2013 he received a commendation in the Major van Someron-Godfrey English Song Prize. He is an active Oratorio singer, performing the role of Septimius in Handel’s ‘Theodora’, Acis in Handel’s ‘Acis and Galatea’, as well as the tenor soloist in ‘Messiah’. As a regular soloist of several Bach ensembles, he has performed in 15 cantatas. William has established himself as an innovative recitalist through his project ‘Song reCycle’. He continues to invent new programs regularly that take older repertoire and cast it in a modern context. He is also fortunate to have been a part of some of the world’s greatest choirs, including the Chicago Symphony Chorus, Oregon Bach Festival Chorus, and Apollo’s Fire Chorus. With these groups he has been a part of several well received recordings, including the 2011 Grammy winner for Best Classical Album and Best Choral Performance, Verdi Requiem conducted by Riccardo Muti. He is married and lives in London, where he also enjoys cooking, eating, travel, board games, squash, and maps.